These are properties where you can stretch out, make a living from the land, or hunt and use recreational vehicles to your heart's content. You will find many sites begging for your new home to be built. #1129 - Central Montgomery County - Hidden land, a short drive in on your own road and this opens up into 3 large fields, about 35 tillable. And it’s all surrounded by woods so your privacy is pretty much guaranteed. Good hunting. The owner has taken firewood, but the last time a logger was in was under the previous owner who’d logged it just before he put it on the market - over 30 years ago. It enjoys the Fonda Schools and is only 2 miles from the school, and the town. Johnstown is 3-4 miles. Good area, with some valley views. $120000 for 64.7 total acres, partly surveyed. #1111 Central Montgomery County - 147 acre property just needs a home. 2300' frontage on a seasonal road gives it all the privacy one could ever wish for. Spectacular views up, down and across the valley, including a view of the County's most famous natural attraction, "the Noses". There is a 30x40' 4 sided machinery shed just 2 years old, along with a drilled well (plenty of water too), and there is a "bunkhouse" which can accommodate a camper under it. The camper shown in the photos can be bought for an additional $4000. Between them, you can sleep 14. The owner asks $285000; taxes are around $3100. 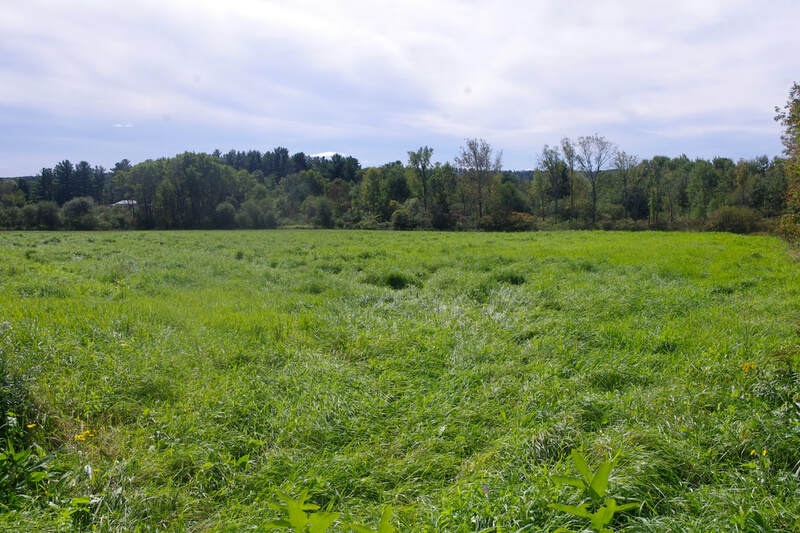 #1112 - Central Herkimer County Hilltop Organic Land – This 109 acres has been certified organic and the crop land is in grass/vetch hay. About 30 acres have been cropped in the past, but currently only the field next to the road is used, about 12+ acres. There are fine expansive valley views from anywhere on the open land. About 15 acres are wooded. You will find 2 potential pond sites, one of which was used as a tiny livestock pond in the past. It can be enlarged if anyone so wanted. There is also a small stream. 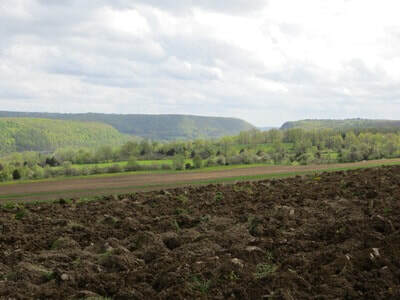 Topography is nearly flat to rolling, with broad sweeping vistas. 7There is over 275' of road frontage and power is along the road, which is a paved Town road, so there's not much traffic. Price: just lowered to $175000; taxes have yet to be precisely determined as it is part of a larger property. But the area is known for lower taxes and there is no reason why it would not be so here either. We estimate a bit over $3000. The property will be surveyed after you have agreed to buy it and it will be completed prior to closing, so it is possible to buy this with less land. As an example, if you want less land, we could sell 45 acres for $67500. Note: there are gas and electric transmission lines which borders the property and these separate 2 small wooded parts of it. The good thing about the line is that you will get to use that land for many of your own purposes and it has a good maintenance trail along it, which gives you additional access to the back of the property. These lines can be traveled for miles and miles beyond your property. A - has about 166 acres and is $220000 (only $1325/acre). 16=5 are in hay meadows amd another 10 in unused pasture and the rest is largely wooded. It includes some wetlands. There are 895’ of road frontage and a stream meanders though the length of the property. Folks are going to like this location – and they'll love the price, less than $1200/acre. We have 100.9 acres, nearly all wooded, and it adjoins both the Nature Conservancy's Lordsland Preserve with its rare Jacob's Ladder plants, hiking trails, and many bird species (35 were identified in a 2 hour period one day) and also the Belevedere Lake property. There had been a home here once, so there is a good drilled well and a driveway. The woodlot has a seasonal stream and 1590' of road frontage, a very quiet location with all the privacy that can possibly be expected. The terrain varies from place to place. 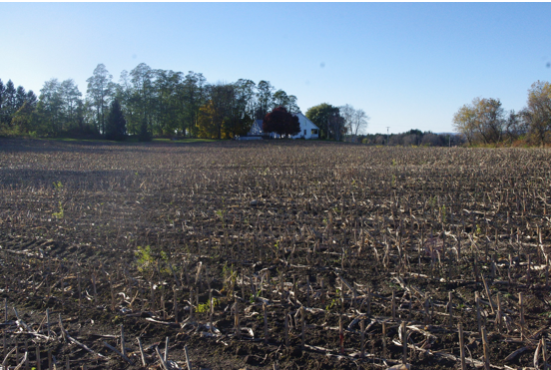 NEW LISTING, NEW PRICE #1136 - Central Montgomery County - We have 194.56 acres, in two parcels, side by side. 35-40- are in grass hay and would probably qualify for organic. 50-60 more are in good woods and most of the remainder is in abandoned fields. there is fronrage on two roads, 1630 and 3227 feet. The property has some southern views and you can walk to a good restaurant or a convenience store - yet it is definitely country here. There are 2 traffic lights and no tolls between here and Albany. 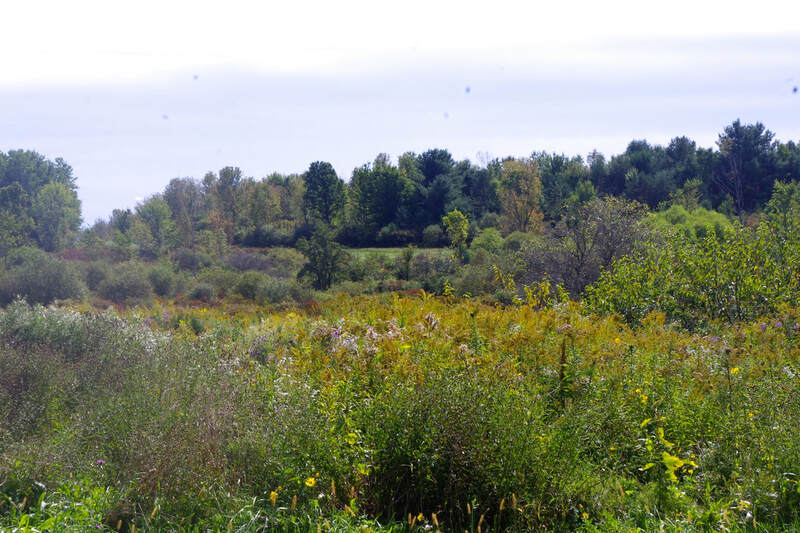 You’ll find 2 small streams and a large shallow pond in the 30 acres of wetlands. 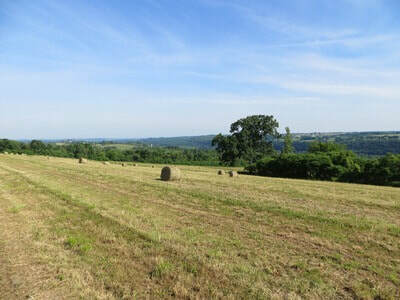 The price was just drastically lowered to $281300 ($1450/acre) and the owners might entertain splitting the property into its separate existing tax parcels. The perfect recreational property: it has trails, a trout stream, 3 ponds, views, with rolling terrain. About 30 acres are open, former pasture - and the rest is forested. There are nearly 2000' of road frontage and it's close to Oneonta, with its 2 colleges & hospital. An airport is not far either. The owner says there are good building sites on the trout stream yet near enough to the road. There is a drive into the interior, but the bridge over the creek needs to be replaced first. It can also be accessed via a seasonal road at the west side of the property. 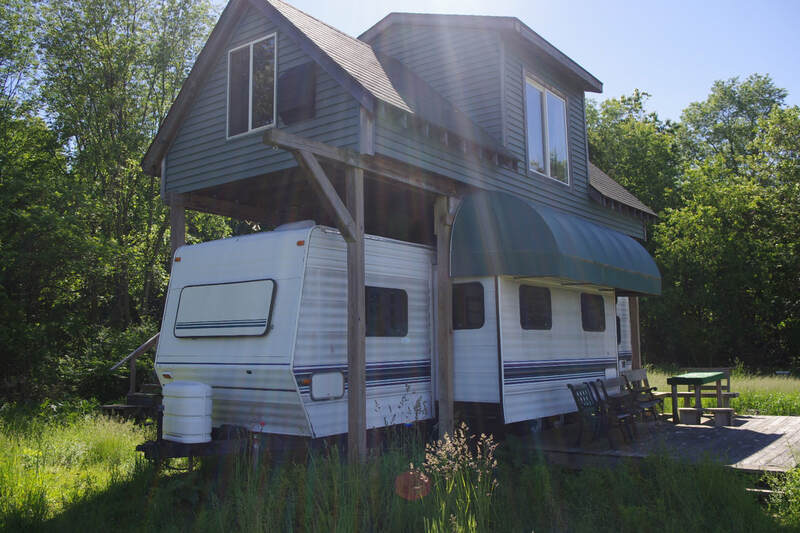 The out of State owner has seen it twice since he bought it a few years ago - and you know what that means: he has decided to price it to get it moved. 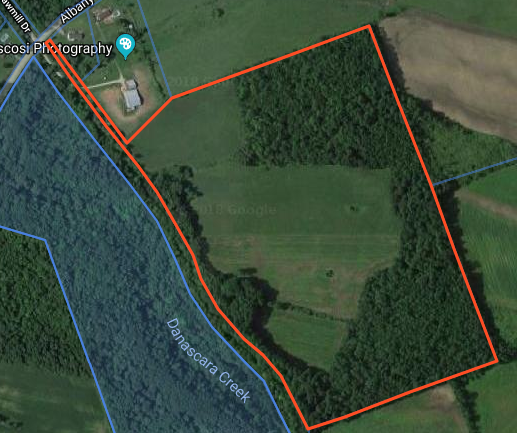 You'll find it definitely priced to go: there are 118 acres here for just $125000 or best offer, the owners wants to raise some cash for a new venture so will listen to what you have to say. Note: this is a $40000 drop in price. Taxes total only $2436, the combined total of T​own & County + School. The owner is willing to give a credit at closing to enable you to rebuild the bridge that once crossed the stream. #1081 Eastern Montgomery County - "Always immaculate grounds" - you will be impressed. Over 50 acres with > 1/2 mile river frontage, tons of road frontage too. 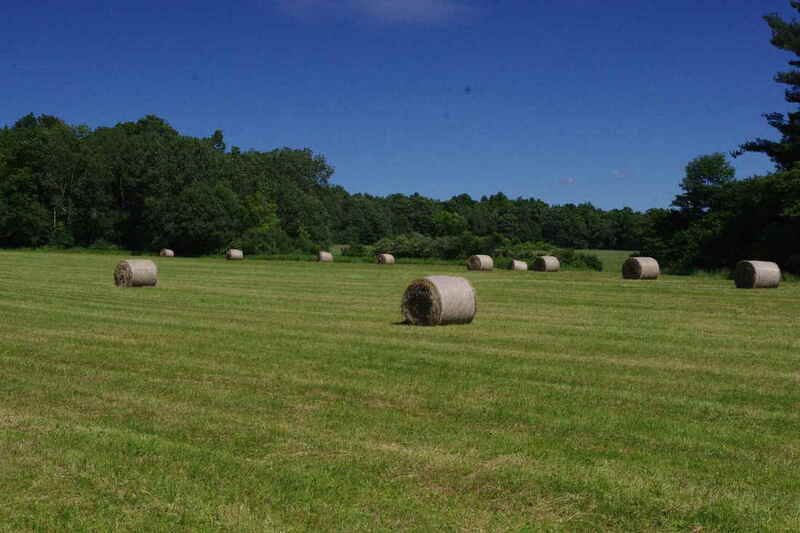 32 acres are tillable and feature some of the State's finest soils. You could land a plane here on one perfectly flat field. Most of the remainder is varied topography. There are 2 small streams and a small pond in addition to the river. There is a small vineyard in one location. It can yield a ton of grapes per year. Well off the road is a cabin which features cherry trim and hardwood floors. It has been insulated and wired though power has not been run to it. It has its own dug well, lots of water. There is a exceptionally well-built 24x40' heated and insulated shop. It's walk-up loft could be easily converted to an apartment. Next to it is the original mobile home, old but functional. Most buyers would use it only until they could replace it with a home or a beater mobile home. 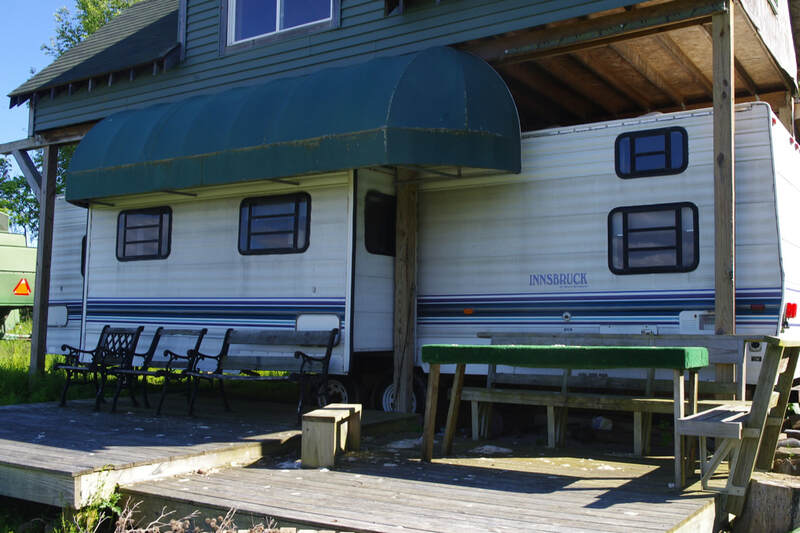 It has 3BR, one bath, and a large deck overlooking the river. A hot tub is on the deck. This is priced at $215000 and taxes are around $3000. He receives enough rent to offset the taxes and insurance. Please be aware that the owner has asked us to limit showings to cash customers only. Also, there are 9 parcels here, already subdivided. You will get all of them for one price and you can then sell off what you don't want or combine them into one parcel for even lower taxes. NEW LISTING #1144 - Eastern Montgomery County. 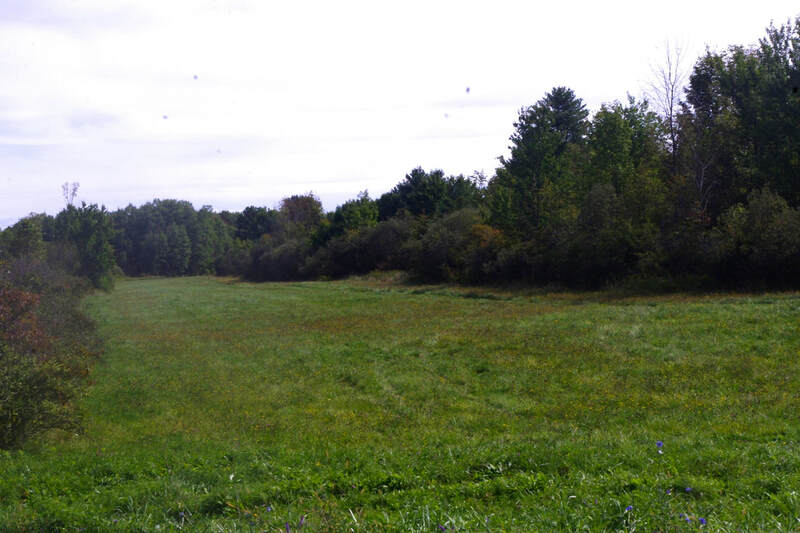 This 82 acre tract should ring some bells for someone - as it adjoins I 90 and is only 1/2 hour from Albany. Seventy acres can be cropped. The majority of this is currently in corn. Huge fields, in a good state of cultivation. In the immediate area, there is a mixture of well-kept middle class homes, a few farms, and, across the highway, commercial development. The property is zoned agriculturally (homes permitted) but it adjoins C2 zoning, so the potential for this is here. A rising tide floats all boats, so that would enhance the value of the subject property. Its long frontage on I 90 (2190’) gives it excellent visibility from the highway. Access is gained from the 890’ of frontage on a side road. There is a dug well, the use of which is shared by a nearby home. Owned electric poles go across the property, giving you a choice of home sites without bringing electric in from the road. They used to service billboards, which we understand could be reinstalled if desired. There is a separate 12 acre woodlot, just a few feet away, but not adjoining. A ROW gives access to this. It is a separate tax parcel so could be separated if someone wished, but it has always been considered a part of this property and the two parcels have always been conveyed together. The woodlot recently had selected hardwoods taken for lumber. It is mostly softwood and none of that was disturbed. The price is $1700/acre - $140000 and taxes are just $1350. 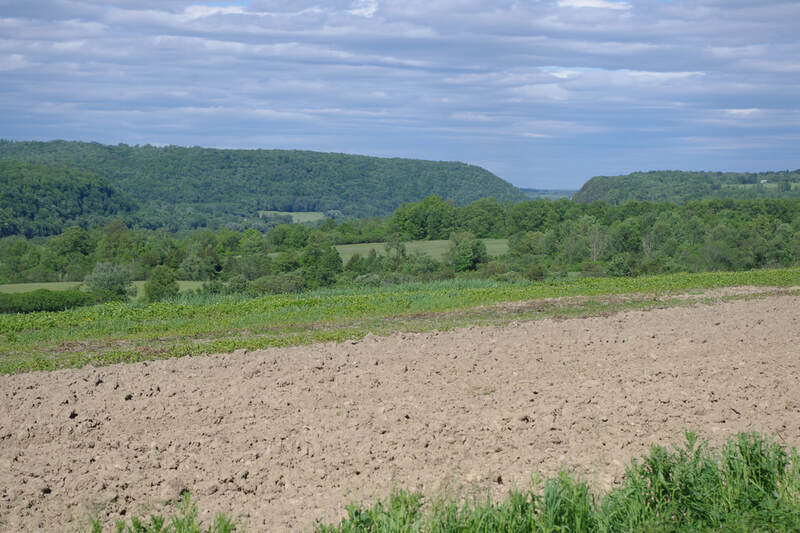 #1020 - Montgomery/Schenectady County On both sides of the line, but mostly in Montgomery County we have a 112 acre farm with well over 1/2 tillable. Some are wooded (good hunting here) and the remainder is in unused pasture. Lots of frontage on a side road, views of this countryside from many spots. Plenty of places to build. The barn is 36x80' and has 36 modern tie stalls, a new milk house with a 500g bulk tank, and a small utility room. There are 2 small silos and a manure push off. A wing is 20x40' and was used to house young stock and to serve as a small shop. There is one other small shed as well. $270000 will take it. This is an attractive place and it is only 1/2 hour to Albany from here, yet the neighborhood is quiet and dotted with small farms.